Did you know? The majority of colleges & scholarships are only going to look at your high school core GPA. You can use the NCAA Eligibility Center to calculate your grade-point average (GPA), based on the grades you earn in NCAA-approved core classes. Therefore, it is important to understand what it is and how to go about calculating your High School core GPA. How do I calculate my high school core GPA? In short, your High School core GPA is based on a 4.0 unweighted GPA scale using the average of your high school core classes. High School Core Classes: Classes in English, math, science, history, or foreign languages. Not including classes in the fine arts or personal skills. High School Unweighted GPA: GPA based on a 4.0 scale. 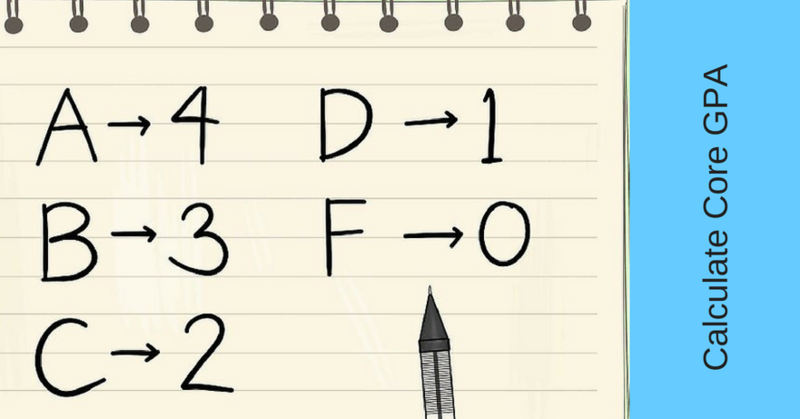 Where an A = 4, B = 3, C = 2, D = 1, F = 0 no matter if it is honors, AP, IB, college, or regular. To calculate your high school core GPA, we recommend using our High School GPA calculator. In case you are unsure of which high school classes are part of your core GPA, we have listed them below. In addition, we provide recommendations based on your college objectives. Classes that are part of your high school core GPA typically include classes in the following five categories. Please Note: Every high school has different classes and calls their classes by different names. This should be use as a guideline. Double check with your high school counselor! There are four IB math classes that cover roughy the same material but vary in difficulty and speed. 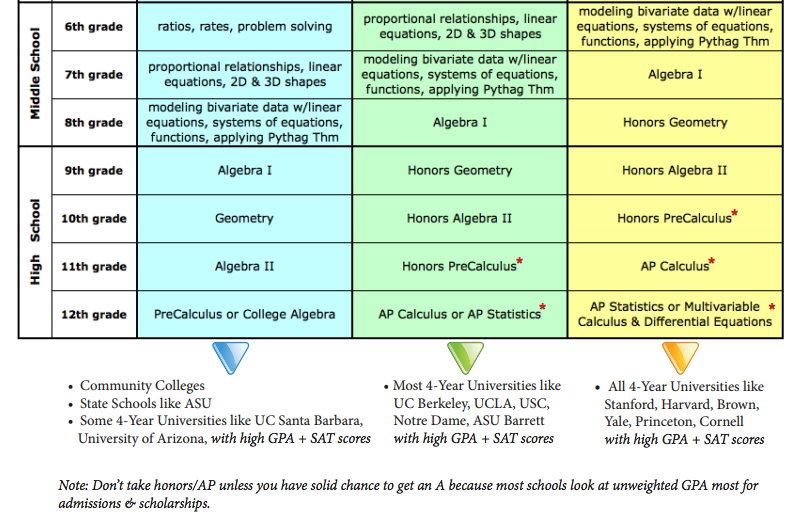 There are three AP Math classes: Calculus AB, Calculus BC, and AP Statistics. Not all students start with algebra 1, and not all students complete all the above courses or follow the above order exactly. There may be additional math-related electives such as computer math that also count toward your high school core GPA. What do colleges look for in your High School core math classes? Most colleges require 3-4 years of core math classes for non-STEM majors, including algebra 1 and geometry. For STEM majors, most colleges require four years of math, sometimes including pre-calculus and calculus. World literature, British literature, creative writing. Some High Schools offer honors English 9, 10, 11, etc. 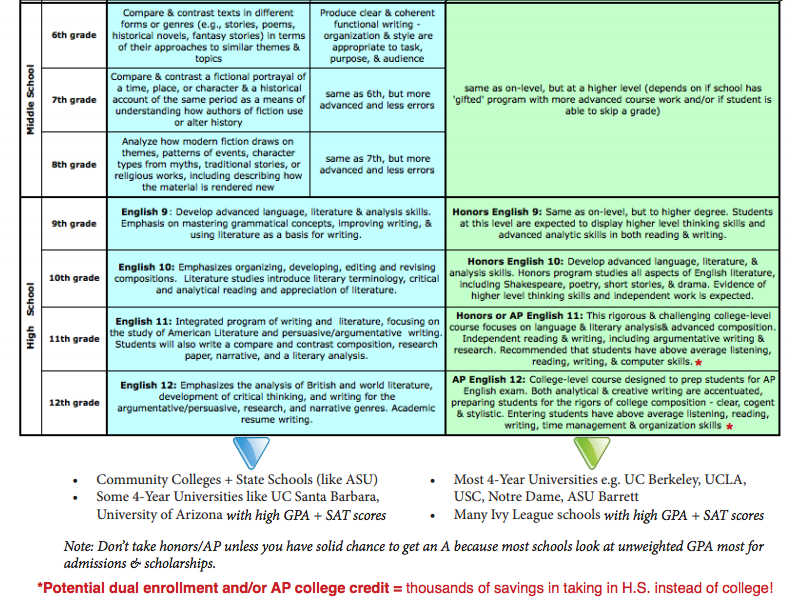 There are two AP English classes: English Language and Composition (usually taken junior year), and English Literature and Composition (usually taken senior year). There are three IB literature classes: Language A: Literature, Language A: Language and Literature, and Literature and Performance. What do colleges look for in your High School core English classes? Colleges will expect all high school graduates to have completed four years of English. Some High schools offers honors biology, chemistry, physics, etc. There are seven IB science classes: Biology, Chemistry, Physics, Computer Science, Design Technology, Environmental Systems and Societies, Sports, Education and Health Science. What do colleges look for in your core High School science classes? Most colleges require 2-3 years of science for non-STEM majors. For STEM majors, most colleges require four years of science, including physics. Some high schools offers honors US history, art history, European history etc. AP options include Human Geography, World History, European History, US History, Macroeconomics, Microeconomics, Psychology, US Government and Politics, and Comparative Government and Politics. IB classes for social studies are offered under the group entitled “Individuals and Societies”. Ten classes are offered on varying subjects. What do colleges look for in your core High School social studies classes? Most colleges require completing at least two years of social studies, often including US history and World or European history classes. Some High schools offers honors for foreign languages. AP options include Spanish, French, German, and Chinese. What do colleges look for in your high school core foreign language classes? Most colleges require completing at least two years of foreign language. To exceed expectations it is recommend you take 3 – 4 years. Classes in non-core areas, fine arts or vocations such as driver education, typing, art, music, physical education or welding. Personal skill classes such as personal finance or consumer education. Classes taught below grade level, at a slower pace or with less rigor or depth. These classes are often titled basic, essential, fundamental or foundational. Classes that are not academic in nature such as film appreciation, video editing or greenhouse management. Your high school core GPA is based on the average unweighted GPA of your core math, science, English, social studies, and foreign language classes as shared above. If you got all A’s in your classes, your core GPA would be a 4.0. If you got all B’s in your classes, your core GPA would be a 3.0. Do you want actionable advice, student & test prep checklist and more, based on your current unweighted GPA, weighted GPA, core GPA, SAT/ACT/PSAT test scores, and grade level? Please click the button below to be directed to our free High School GPA calculator.